We use the DGCA-approved Redbird MCX (the first and only one of its type in India) motion aircraft-simulator. The device is also approved by USA’s Federal Aviation Administration as an advance aircraft-training device (AATD). Our simulator can be used by trainee-pilots to practise exercises pertaining to the Piper Seneca and Cessna 172 (glass-cockpit) type of aircraft under the guidance of a DGCA-approved simulator instructor.. The DGCA permits students to log hours flown on the Redbird MCX simulator towards their training as per the Civil Aviation Requirements. At Falcon, we treat an aircraft as a laboratory that should be used by the instructor to demonstrate an exercise to the trainee-pilot and where the student should subsequently be able to replicate the same exercise to DGCA’s examination standards in the presence of the instructor/examiner. The Redbird MCX is possibly the best simulator in its category for flight-training in the world today. Its full-motion capability limits the risk of committing mistakes while actually flying and gives the student a real and first-hand feel of the aircraft in the safety of the classroom. Every trainee feels considerable psychological pressure during an actual flight even when executing a seemingly simple manoeuvre such as a climbing or descending turn. The g-forces acting on the uninitiated body of the trainee pilot trigger an adrenaline-rush that makes learning a secondary and forced response. Training in a simulator eases the psychological pressure on students, allowing them to concentrate on observing and learning a manoeuvre rather than dealing with physical and psychological stresses. The Redbird MCX simulator is equipped with advanced options like ‘Parrot’, a software that can also simulate aircraft to air-traffic controller communication. Besides this, the simulator is capable of providing multiple training scenarios from the simple ones such as taxying, take-off and landing to the complex ones like navigation, instrument approaches into complicated airport scenarios. The simulator is a very safe option for the trainee-pilot to get a feel of scenarios such as encountering rough weather and diversions to another airport during a simulated cross-country flight. Our simulator is also equipped with ‘Cygnus’, a software that allows trainees to incorporate the use of iPads so that they may be able to master the various aviation applications which have now become common-place even in the domain of professional flying. The ‘Insight’ software installed the simulator allows outside views of a trainee’s flight to the instructor and also allows for DVR-style rewind and playback. This technology is immensely helpful in the process of achieving perfection in the execution of simulator-based exercises in preparation for the real flight. Flying an actual aircraft can be much more expensive compared to training in a simulator. 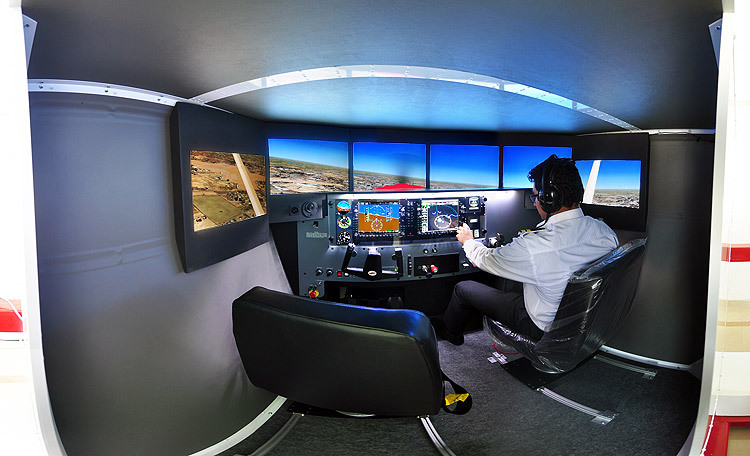 Our full-motion simulator provides the option to practice all real-life possibilities and scenarios in the safety of the class-room at marginal costs compared to real aircraft. » Electric motion: 50 degrees-Pitch, 40 degrees-Roll, 60 degrees-Yaw. » Dual-yoke, dual-rudder fully enclosed cockpit provides the most realistic feel compared to any simulator in this category. » Capable of single and multi-engine training, i.e. Cessna 172 glass cockpit & Piper Seneca PA-34.